A few weeks ago, I finished painting a chest/dresser piece for my friend An. I wanted to share this project and tutorial with you guys because there are times and good reasons why painting furniture with enamel (oil based) paint is the best type of paint for some types of furniture revamps. 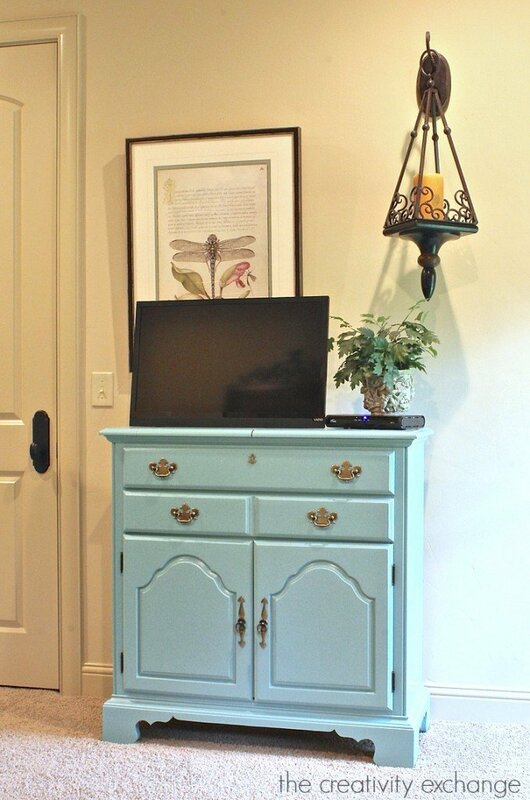 This furniture piece is the perfect example of when oil based paint is the best choice because it’s going to be used as a small media center for when An’s Grandchildren come to visit, which means this piece will be heavily used. Oil based enamel has a very durable finish that won’t scratch or wear much, even after years of heavy duty use. An oil-based finish also cleans up so much easy than water based paint. Oil based paints are ideal for furniture pieces like kitchen tables, media centers, front doors, nightstands and pieces that will get used heavily every day. I know some people get nervous and think that painting with oil-based enamel is hard to work with but it’s really not. Also, oil-based finishes have come a very long way and I personally prefer the gorgeous butter satin finish over a water based latex finish. The best part is no top coat is needed and unlike water-based latex, the oil-based finish can go 5-10 years without needing to be repainted. You’ll want to sand the piece until you can no longer feel the ridges and the piece is smooth (do not sand the primer off). This sounds like it would take a long time but you’re just going over the piece lightly to take the edge off and it should only take 10-20 minutes depending on the size. After you have lightly sanded, wipe down the piece completely with a damp cloth to get all of the residue and allow it to completely dry. 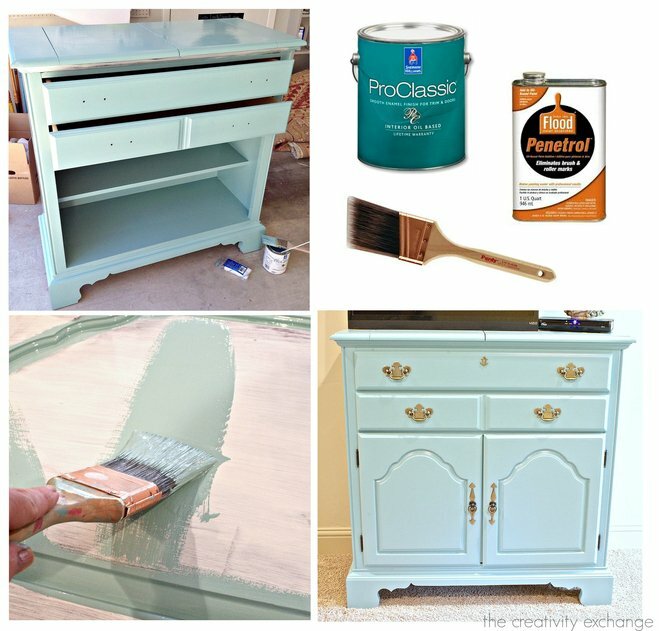 A little oil-based paint goes a long way and I painted this whole chest twice with one quart of ProClassic. So you don’t need much at all. I pick up a few extra plastic paint measuring cups at Sherwin Williams (I think they are $1.00) and I fill the cup about 2/3rds full and add 2/3rds cap full (using the Penetrol cap) and stir until the Penetrol is blended. 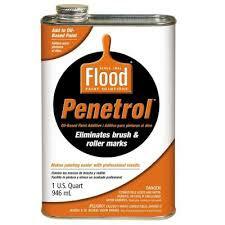 Be careful, too much Penetrol will make your paint too runny. If you’re not using the Sherwin Williams paint measuring cup, follow the directions on the back of the Penetrol can. It’s also important to use a brush specifically for oil-based painting. I like to use Purdy brushes (Sherwin Williams and Lowe’s both carry them). It makes all of the difference to use the right brush and bristles! I use an extra plastic measuring cup from Sherwin Williams and fill with paint thinner to clean my brushes after use. When I paint with oil-based enamel, two coats are all I need. It’s important to wait a full 24 hours to allow the paint to completely dry in between layers. Oil-based paint takes a very long time to dry and it’s usually the full 24 hours. For the first layer, I paint in one direction and the second layer, I paint my brush strokes in the opposite direction. If you’ve added the Penetrol to your paint, you will see after about 10 minutes that the paint spreads and levels out and brush marks disappear. Don’t panic if you have a lot of brush marks. They will go away if you’re using Penetrol. The great thing about the Penetrol is even if you can see brush strokes, again, trust me, don’t worry, after about 10 minutes the Penetrol will kick in and the paint will level out. If you mess up and need to fix something, just add more paint to your brush and go over it again. Oil-based painting should always be done outside but some of the smaller components can be done inside. I have a ceiling fan in my kitchen and paint a lot on my center island under the fan to get the components to dry faster. 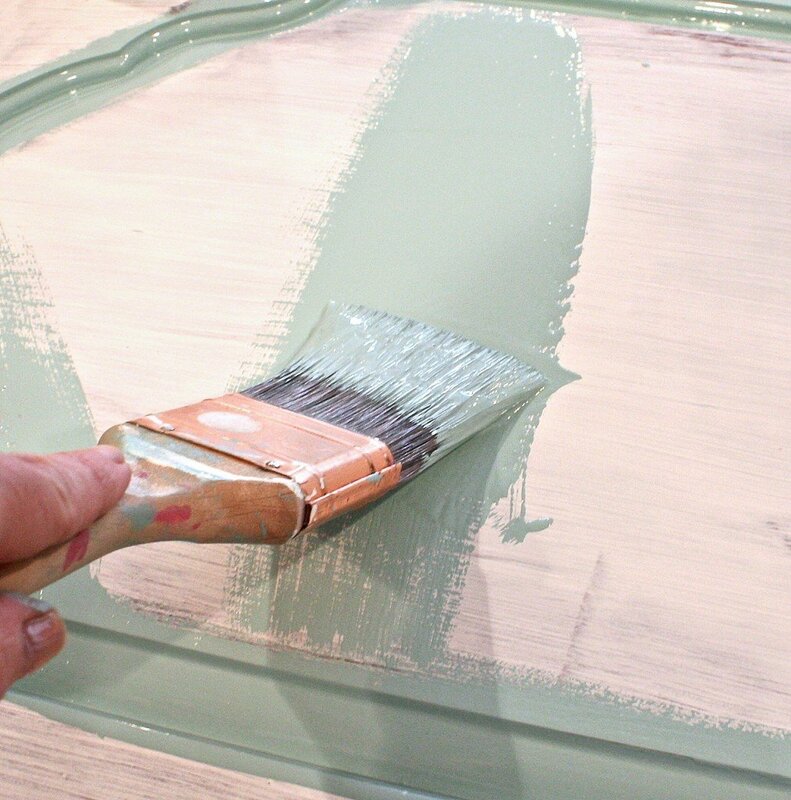 Really and truly, as long as you’re using a brush for oil-based paint and you are doing good layers that are not too thick and not too thin, you should end up with a beautiful finish. After you have painted your piece, oil-based paint takes really a full 7-10 days to dry and cure. While your piece may feel dry to the touch, it is not completely dry and cured for 7-10 days and you will not want to use the piece until that time. Just like you said, I have been fearful of trying oil based paint. You have now taken a lot of the fear out of it and I will give it a try. The color you used for the chest is really nice. Thanks for all the great info as usual. I’m so glad that you’re willing to give it a try Debbie because the finish is so worth it! 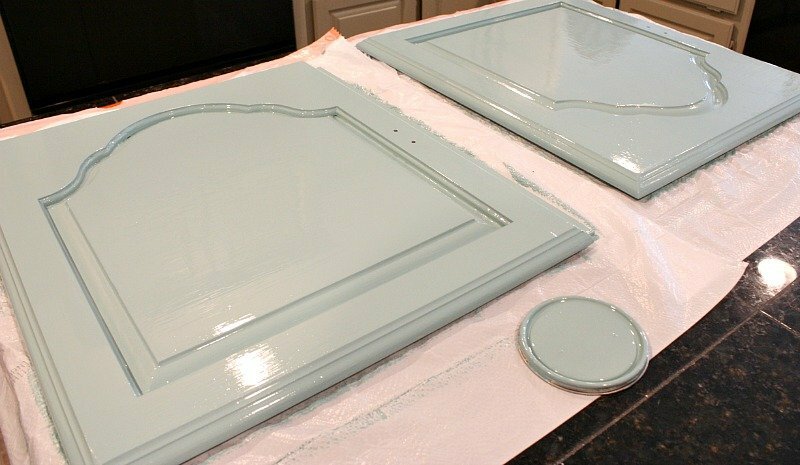 Once you paint a piece with oil-based, you will see how easy it is and how durable that finish is. Thanks for stopping by! 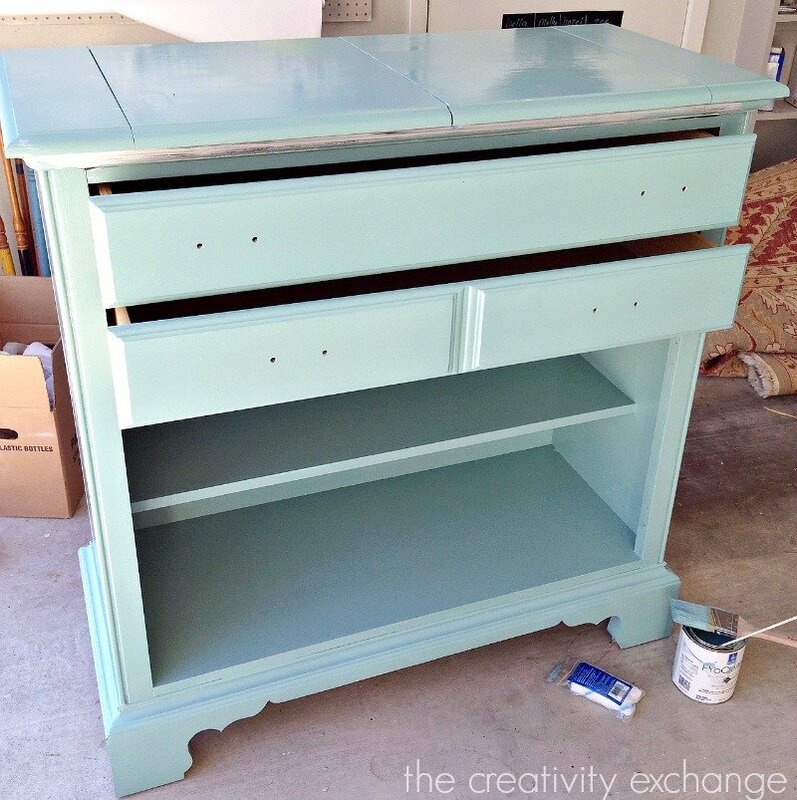 I love your little chest of drawers revamp – so cute! And thanks for the painting tips – I might have an oil-based paint project in my near future and I really appreciate knowing about the Penetrol! The best oil paint is a matter of perspective. I dislike SW. The fumes are overpowering and it does not level without penetrol. BMoore is my go to for oil based paint. I will drive the extra hour to get it. It lays beautifully and dries to the touch in 2-4 hours and the difference in fumes in huge. SW also still feels tacky after 12 hours. Just a different opinion. I haven’t had any issues at all with a strong odor with SW paint but then again, all oil-based paint is going to have a stronger odor than latex. Although, I always use a mask whenever I paint with oil based. 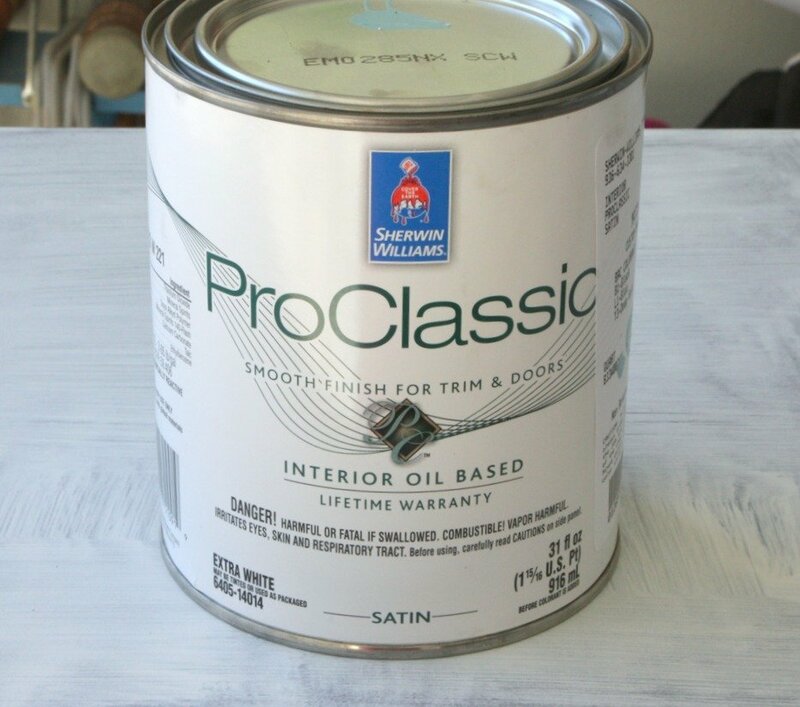 You’re, Penetrol is absolutely needed with SW paint and it will not level as well without it but the difference for me with SW ProClassic and other paints is the beautiful finish. I have used BM paint before and it’s good but I do prefer the end result of SW paint better. It’s more of the finish that I’m looking for. SW is probably more of a finicky paint (it does take forever to dry) but in the end, the finish is more beautiful to me than other products. Thanks so much for your great tips Cyndy!! I love the finish with oil based paint and have done several projects but haven’t ever used any additive, I’m off to Home Depot to get some. Now, if it would only stop raining! These are great tips, Cyndy! I love ProClassic but have only used the water based one. Your piece turned out so cute! Thank you Cyndy! It has been a while since I have painted furniture and you have reminded me of how fun it can be! I have a kitchen table I don’t like and have debated selling, you have given me the confidence to paint it. I’ve been “haunting” your site for about 2 years now and have enjoyed your posts and ideas so much! 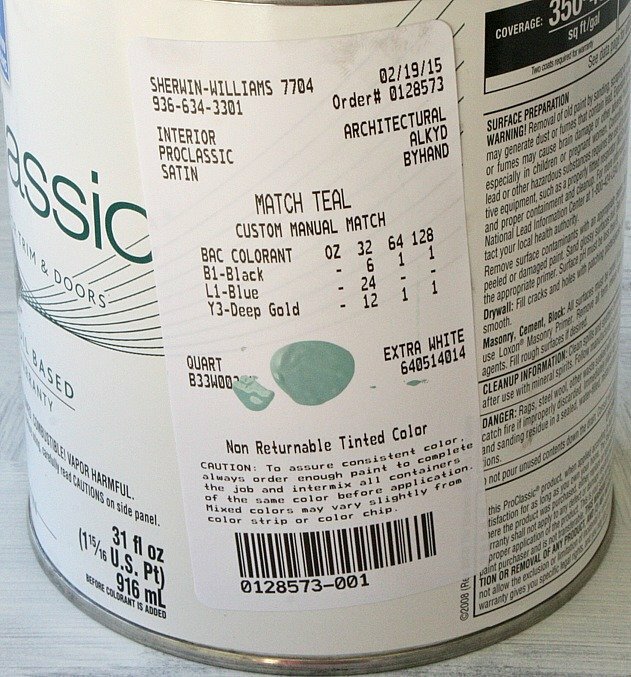 This is a great info article about the SW Pro Classic Oil Based paint, which I love. In your professional opinion, what do you think of th Pro Classic Hybrid paint..durability, comparable to Oil, etc? I have a client debating which formula for heavy wear media, gaming cabinets and/or kitchen cabinets. Our problem is selecting her color choice is limited from one formula to the other. I haven’t had the chance to test the Pro Classic Hybrid but I called my main contact at SW and asked him his thoughts and he said that the Pro Classic oil-based has a prettier finish and is easier to work with than the Hybrid. He said that it’s a good paint but if you’re comparing the two, the finish of the Pro Classic oil-based is superior. He said that Hybrid tends to drag a little in application (even with an extender), which of course is a major factor to the overall finish. The time that you would probably choose Hybrid over the oil-base is if you’re in a restricted area and need the lower voc or personally want the lower voc. For me, what it always comes down to and the way I make a decision if using oil base vs. water is if this is a type of piece that doesn’t get heavy daily use and if it’s a piece I would change the color every couple of years, I would go with water based. If it’s a high traffic piece that I would tend not to repaint for 5-10 years, I go with oil. Oil base does have a thicker finish and builds up more than latex. So it’s not ideal for constant repainting. I hope that helps Lynn! Thank you so much for your note! Hi Cyndy! I have never painted with oil or used Penetrol so I really appreciate the tips you have. 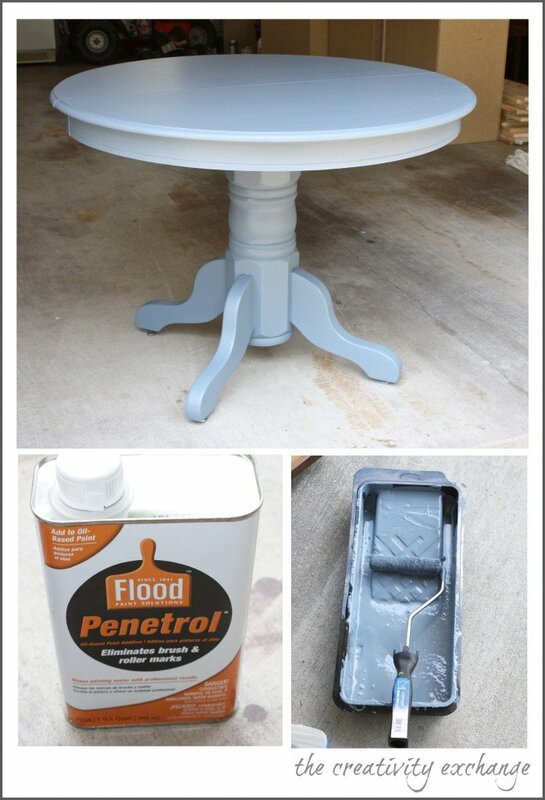 One question–when using Penetrol (or Floetrol) can sections of the furniture (such as the sides) be painted vertically? It seems like using the additives to level out the paint would also cause the paint to run a little. If you’re using the right amount of Penetrol or Floetrol, you should have little to no running. In fact, this is how I know I used too much if the paint runs and I adjust by adding more paint to my measuring cup. I always try to paint everything I can flat. However, I did not do that with this chest and had very little run. Although, I always look over what I have painted to check after about 15 minutes and swipe my brush over an area if it has run a little (there will be just a very minimal amount if painting vertically. The great thing is that another benefit of using an extender/additive is that it gives a longer brush open time, so even after 15 minutes, swiping over the paint is fine. The run will not be immediate, it will happen in 10-15 minutes after painting and the extender kicks in. Hope that helps Karen! Thanks for your note. I just saw this in my Facebook feed. I had never thought of painting with oil paint, but after reading this I might just try. I have wood kitchen chairs and the legs of a table that I need to be updated. 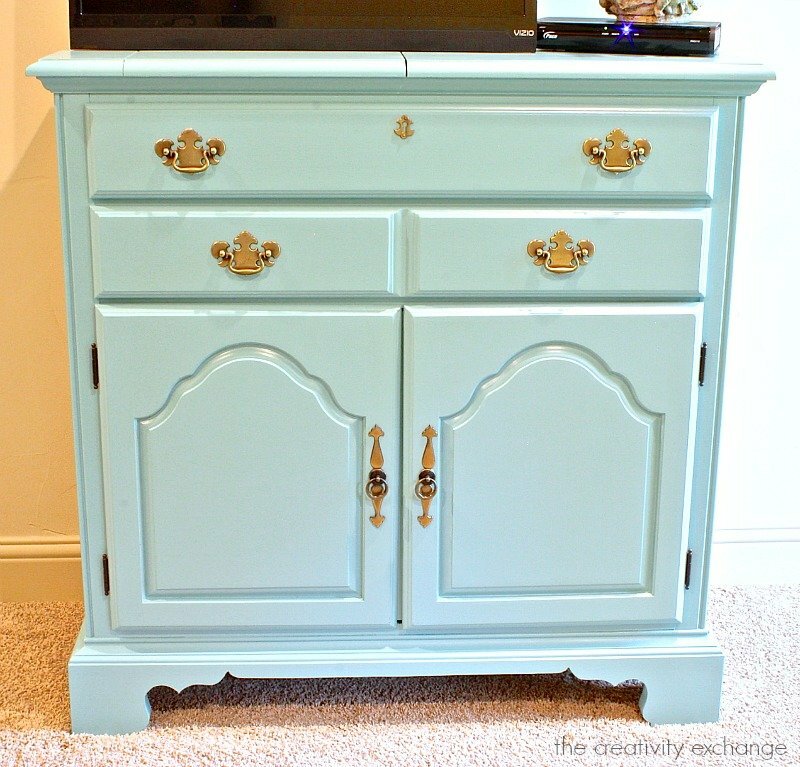 I was going to try chalk paint, but I think I would like it better this way. Also, by using the primer I should have to worry about the stain that could show on some sections of the chairs. I love oilbase & can tell the difference from latex from afar. To make latex look better and spread better use the equivalent additive for latex–flotral to thin it, not water. You’ll have fewer brush marks and it will look more like the marzipan look of oil. I have a white Scandinavian bedroom set that needs touching up. It appears the furniture was professionally sprayed at the time it was manufactured. I am wondering if I need to use primer if I plan to use white paint again? Can I just lightly sand the furniture prior to painting it? Also, can I use the oil paint and extender and roll it on my furniture vs. brushing the furniture? Is another option, to take the furniture to an auto body shop to get professionally spray painted? Thank you for your help. I love your posts. Quick question: Why did you use a roller first for your table but not for this chest/dresser? Thanks so much! Hi Francine! Thank you for your kind words! I actually could have rolled it on the chest but with the narrow area behind the drawers, nooks and detailing, I went ahead and brushed it on. If it was a bigger chest, I would have rolled it on first. Thanks for your note. Can this method be used on laminate furniture? I have a dresser that I would love to revamp. Hi Heather! Yes, my tips for painting with enamel will work great for laminate furniture, in fact, enamel is what I recommend for painting laminate. Just be sure and use a deglosser first (I did not mention that in the post) and a really good primer like Kilz. You should be good to go! Thx for your note! Hi Alicia! Oh yes, enamel looks amazing sprayed on. If you do spray it, check with the guys at Sherwin Williams/Benjamin Moore store to see if it would work with the Penetrol mixed in. I’m not sure I see a reason to use the Penetrol/extender when using a sprayer because it could run. Good luck! I am painting a desk with enamel water base i have one coat on and am seeing brush marks can I fix this? Did you use Floetrol paint extender in the paint? Penetrol is the extender for oil based and Floetrol is used for water based and when mixed in with paint, it eliminates brush marks and hardens the finish. 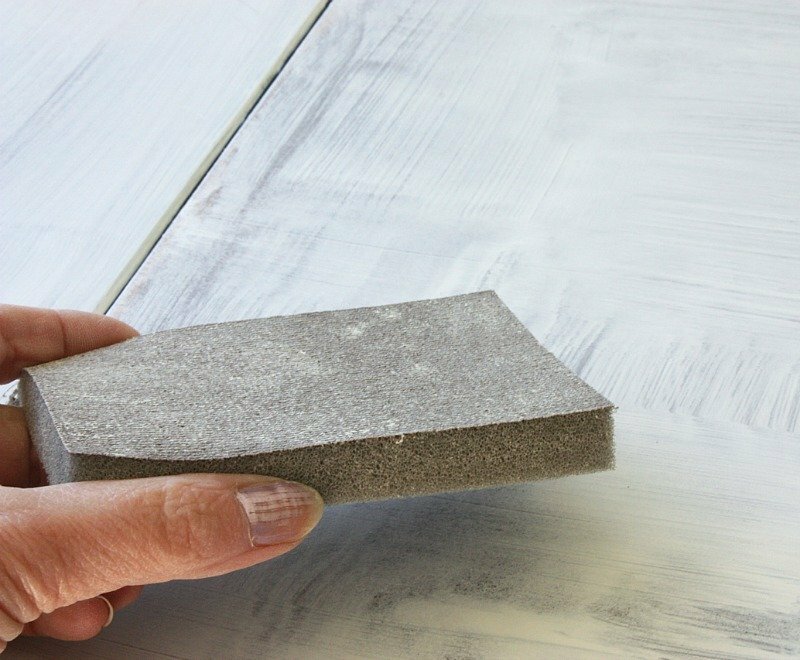 If you didn’t use it and you have only done one coat, I would lightly sand the first coat once it completely dries with the fine grit sanding sponge. You’ll just want to take the edge off of the raised brush mark ridges. 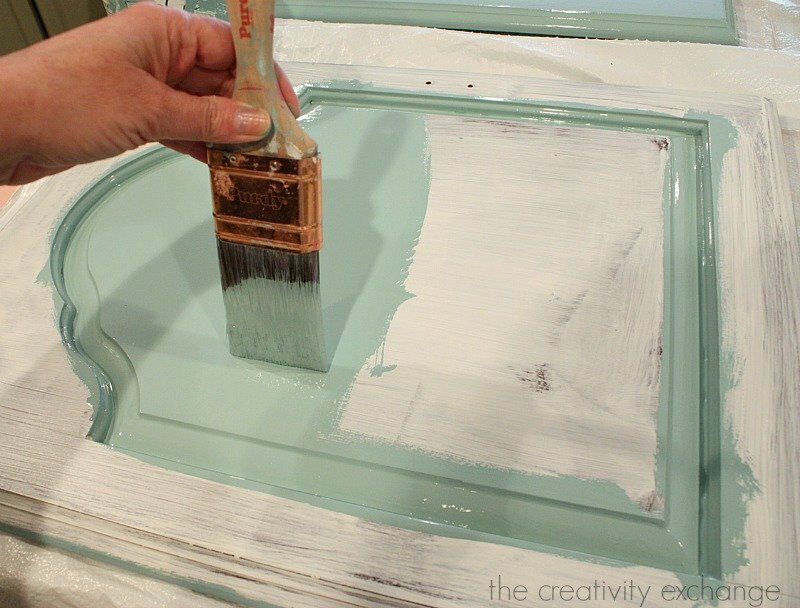 Next, mix in the Floetrol according to directions with your paint and do another coat. Hope that helps. Can you distress the edges of a piece with oil based enamel? Would it ruin the finish. I am wanting to paint a table top and chair seats but was wanting a more vintage worn look. I am in preparation to paint a wood console, and after reading your posts, I am leaning toward the oil based. 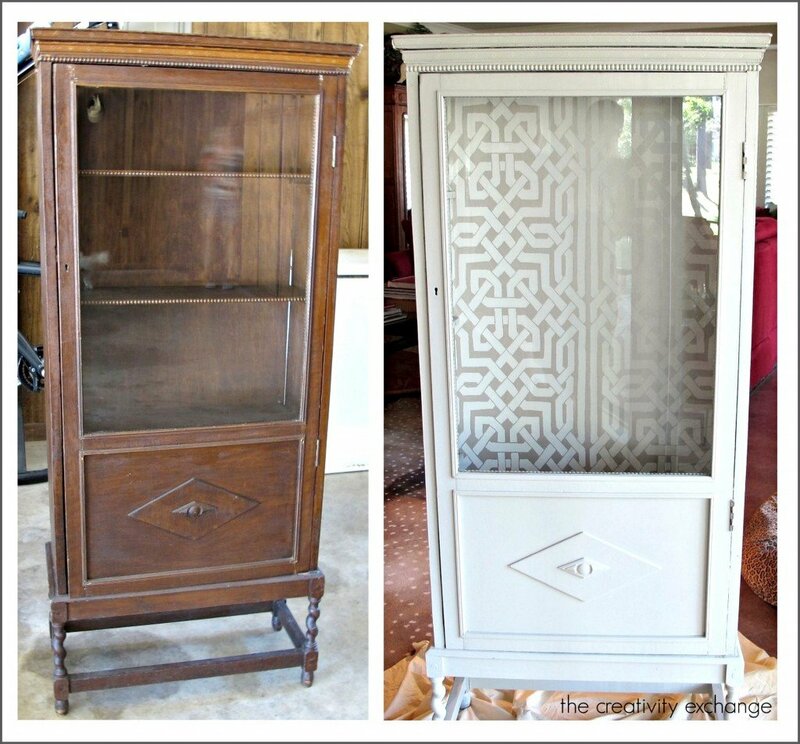 I am desirous of painting the top with a ebony color, the remainder with a cream color and would like to go back over the cream with the ebony color, then wipe most of it off leaving the darker color in the groves. Will I be able to achieve this look using the oil based paint, if so, how? You’ve almost convinced me that I can paint my honey oak kitchen table & chairs. The chairs though, they are mission style with lots of slats. Do you have any tips on painting chairs? Thank you! I’m painting a kitchen table and chairs with oil paint. 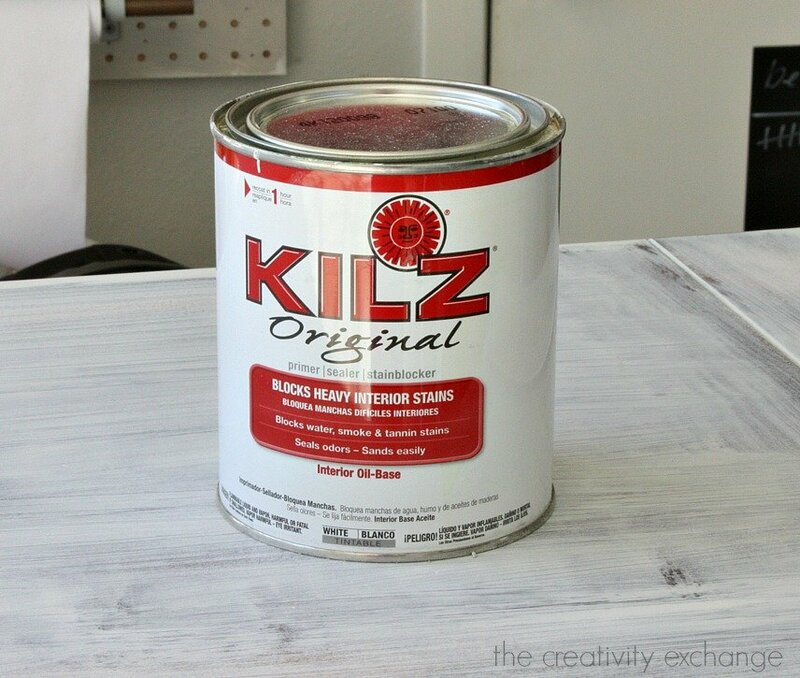 I bought the Original Kiltz oil primer to use first. After I started priming someone told me that I was using the wrong primer. That the wood mentioned was more for trim and walls. I’ve had the pieces professionally striped to the bare wood. (maple). What is the best and proper primer to use? I’m using Sherman Williams oil paint to finish. Your help is appreciated. You picked the right primer if your top coat is going to be oil. If you were going to paint with latex/water based, you would choose a latex/water based primer. Hope that helps! I am wondering if you sanded the chest before priming and painting. 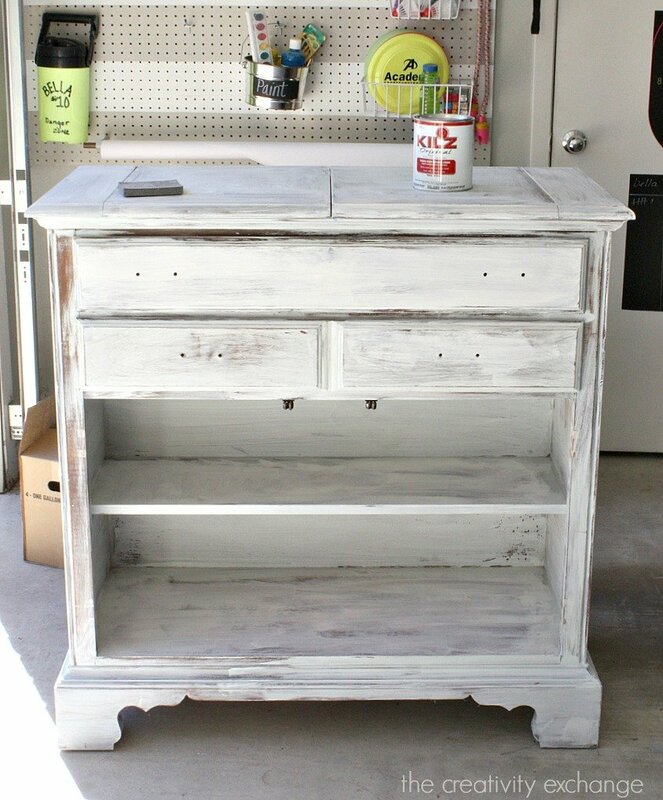 Was using this site to get tips to re-finish a dresser. A few points on Penetrol. This post says a cap full for a quart mixing cup – way less than the directions on the can. For a quart of paint you would be at 10 oz of Penetrol per the can instructions. I did that and it ran, it dripped, it was too thin. So, maybe something like a cap a quart is right. Just a thought. The can instructions may work ok if you have all horizontal surfaces. You’ve answered all the questions darting about in my head. There’s a desk in my house that currently has worn-out brown stain, and I’ve been imagining how I could transform it into a jewel-toned (possibly fuschia) piece to use in my home office. And our Sherwin Williams store is two exits away. 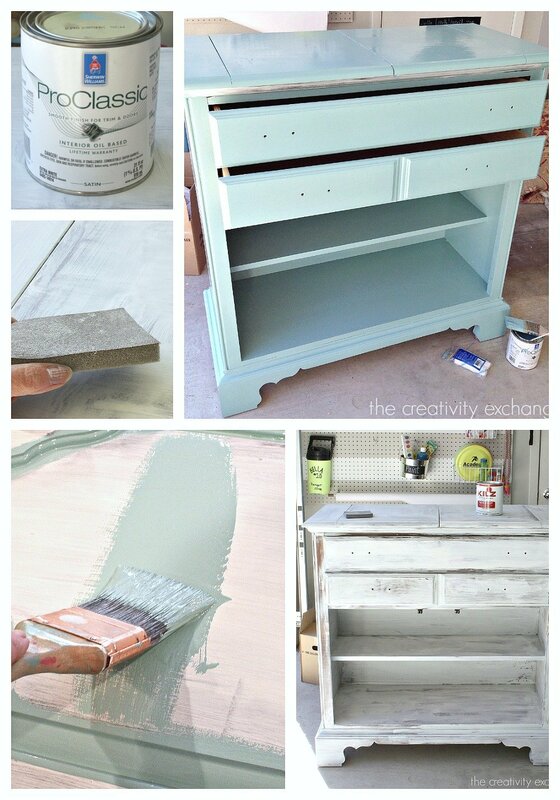 Could I sand a table that I painted with chalk paint and then repaint it using the oil based paint? I don’t like the look of the flatness of the chalk paint even after using a wax topcoat. Still dull looking. I tend to like the satin look with paint. This too, will be my first time using an oil based paint and after reading your post, you make it sound less scarier to use! Also, what are your thoughts of using Velvet Finish? Does that have a sheen finish? I’ve been interested in getting some to try on a small table I have . I appreciate all your expertise that you share with us. Have a great day! !